As technology improving day by day all over the world, Saudi Arabia attracted many expatriates by providing the updating technology to government offices. 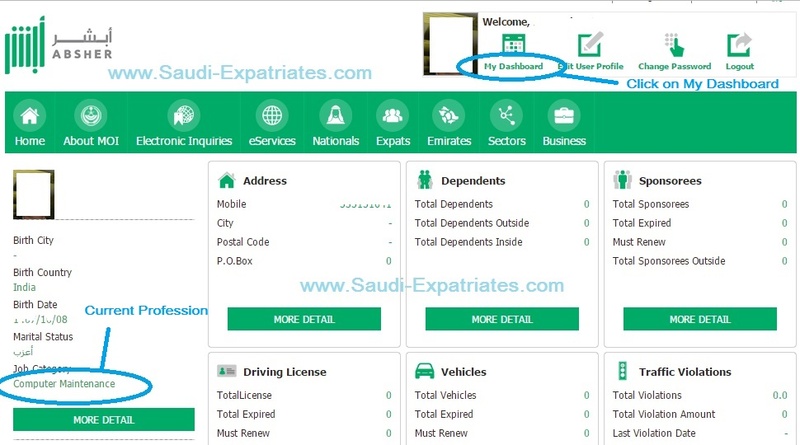 Expatriates and nationals can access the updating technology benefits from online Ministry of Interior website, No need to go to your sponsor again and again for little little information. 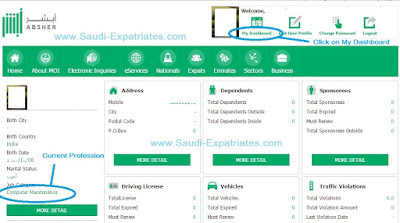 Many expatriates unaware of the online benefits provided by Saudi government officials for them. As we already seen, Requirements for Changing your profession on iqama and Reason for rejecting professions change in this article Change Your Iqama Profession. To check the status of your iqama profession follow the below steps. 1. To access to this service you need to register account in Ministry of Interior, To do this follow this article. If you already registered you can continue. 2. Login in MOI website with the user name and password you registered and Click on MY DASHBOARD (see the below picture) from the available tabs. 3. Now you can see your current Profession (See below Image) which is left side and exact below your photograph. My iqama profession is changed but in absheer account by login to MOI it is blank.. how i will get it updated, i already received my Iqama but still it is blank on moi.